If you're looking to export square photos from Lightroom, perhaps for posting to Instagram, the standard way to do it would be to create virtual copies and use the Develop module's crop tool to change the aspect ratio to 1:1. And doing it that way has its virtues. It gives you the option of customizing where the crop is applied in each photo, for instance. But I dislike creating all those extra virtual copies. They can create complications if you're working in publish services or collections or are using filters that rely on unique metadata in each image. Sure, I could just avoid the virtual copies by cropping the original images, but then I risk messing those up if the undo isn't done just right to all of them. And if you're working from a publish service, you'll likely trigger the images to be republished. So it would often be simpler to be able to crop the images to a square as part of the export process. But Lightroom doesn't have a built-in way to do that--all of the resizing options preserve the image's aspect ration. Export a rectangular image and you'll get a rectangular image. But after trying various options (the endlessly useful LR/Mogrify 2 plugin initially seemed promising, but it doesn't work for this) I did figure out a way to crop to a square as part of the export process. It doesn't require any cropping in the develop module, and you don't end up with a bunch of virtual copies cluttering things up. 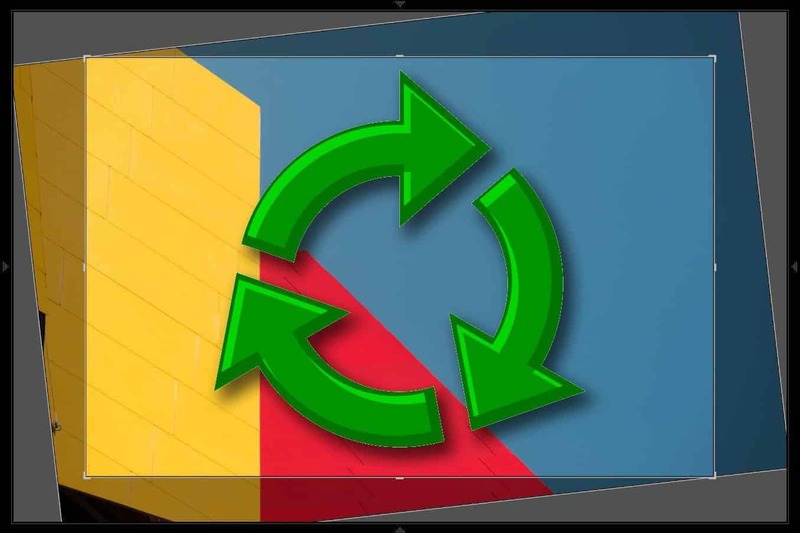 And because it is an export action that functions in addition to all the regular export actions, you can apply it to multiple images and use any other export settings you want. It's using a plugin from Jeffrey Friedl, one of the best Lightroom plugin developers around. In this case, it's his Crop for iPad plugin. From the name, you'd be forgiven that this plugin does something quite different. And it's certainly true that it's focus is on creating images that are perfectly resized for a host of mobile devices. In fact, it has dozens of profiles already built-in for many smartphones and tablets. But you can also use it to create square images as part of the export process. And that's because the plugin has the option to define your own custom dimensions. 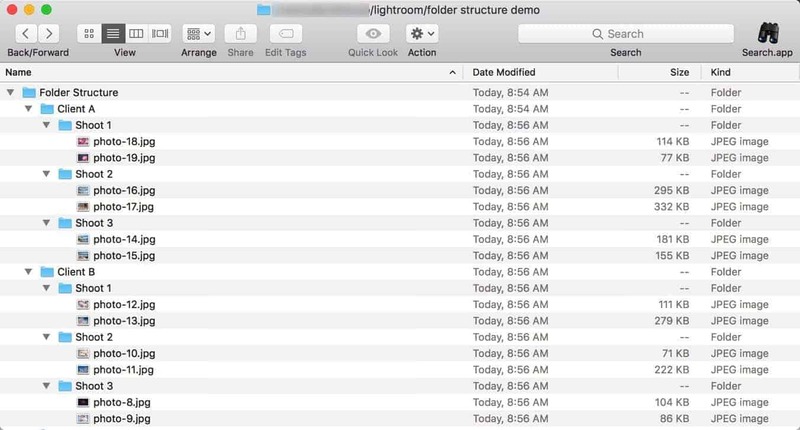 The plugin also has other features like being able to filter by keywords, but they're not necessary to simply crop to a square as part of Lightroom's export process. 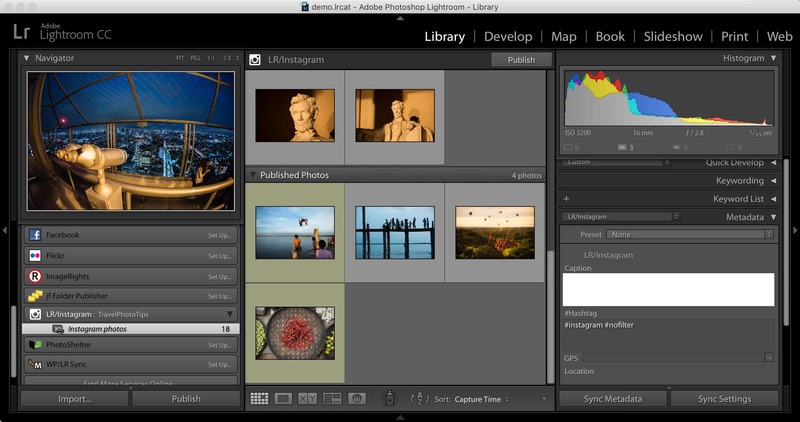 So here's a quick rundown of how it can be used to export square photos from Lightroom. 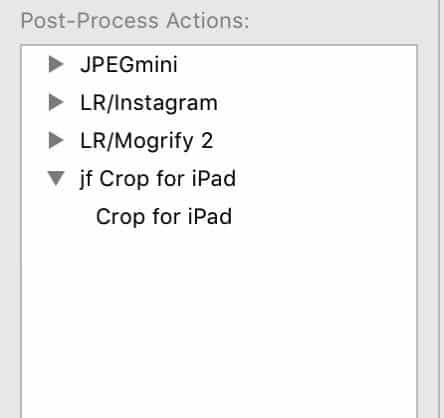 You install the Crop for iPad export action in the same way you install most Lightroom plugins. That is, copy the plugin file you've downloaded to folder you're using for your Lightroom plugins. Then go to the Plugin Manager, hit add, and find the corresponding plugin file. This is an export action plugin, so you use it as part of the export process. 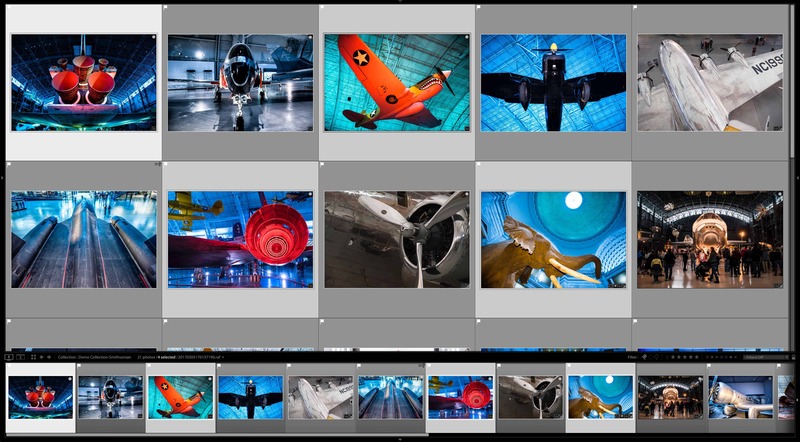 Select the photos you want to export, and then go to export them as you normally would (File > Export or SHIFT-CMD-E (Mac) or SHIFT-CTRL-E (Windows)). Everything will look like it normally does, with one small exception. In the bottom left of the export panel you'll see it listed in the Post-Process Actions panel. Double click on it. That will add it to the bottom of the export options. Because this is applied at the end of the process, you can still use all of the normal tabs to set things like export location, filenames, sharpening, and watermarking. With one exception--don't use the usual Image Sizing tab. That's because you're going to control it with the Crop for iPad options. Trying to use both at the same time adds unnecessary complications and you might end up with unexpected results. In this screenshot, I've collapsed all the standard export option tabs, but you can see that they're still there. The Enable box should be checked. If it's not, check it. In the Target Device drop-down, choose Custom. Then, in the Target Size in Pixels, enter the dimensions of the sides. If you want a square, you obviously enter the same for the width and height. In this example, I'm prepping them for Instagram, so I'm using 1080px, which is the size that Instagram displays photos at. The keyword set options aren't really relevant to the basic process I'm using here, but you can use them if you've added keywords to the images that help determine how this plugin is going to crop them. The next choices are how the crop is applied. 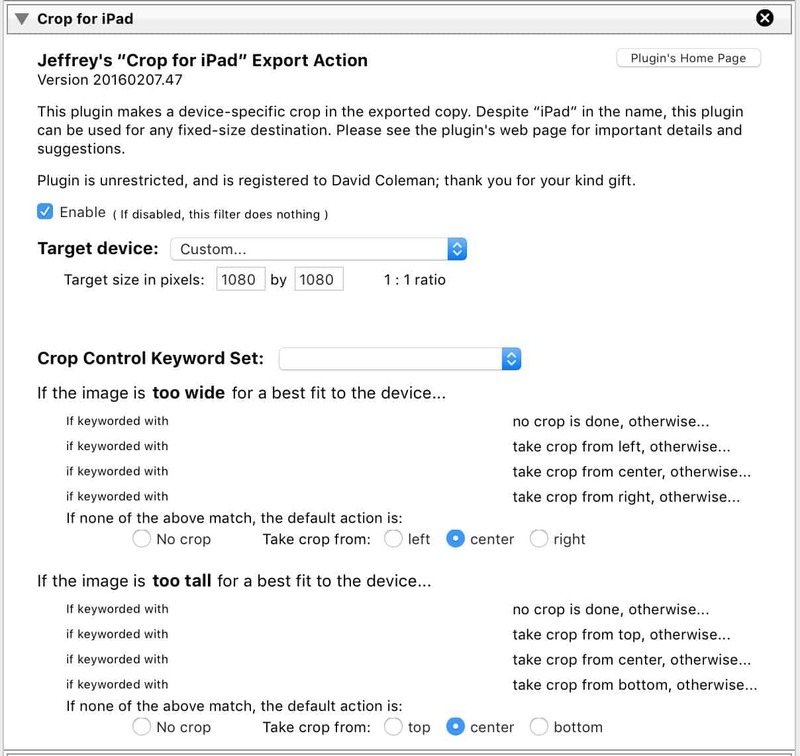 Unless you're using the keyword options, the crop is applied the same way to every image. If you want to trim off both sides and focus on the middle of the image, choose center and center. If you want the crop to be taken from specific edges, you can choose those here. And that's it. Once you hit the Export button, Lightroom will generate the new files and you can then upload them to Instagram or do whatever else it is you're doing with them. 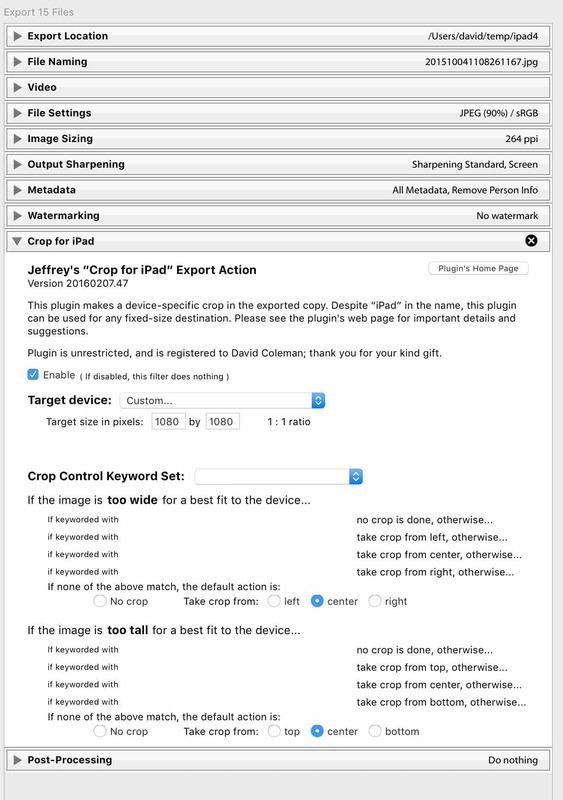 You can download the Crop for iPad plugin from the developer's website. There's a time-limited free trial. After that, it's donation-ware, which means you can donate an amount of your choice to unlock it. Instagram is famous for square photos, and when it started that was the only option. But there's now no requirement that the image you upload starts as a square. Instagram now allows rectangular images, and most methods of uploading to Instagram allow you use a rectangular image and crop it to square if you wish. Nevertheless, there are sometimes some advantages to starting with a square, especially if you're using any kind of automated process. There's also another way to post directly from Lightroom to Instagram and therefore skip the export process completely (or, at least, make it something that goes on behind the scenes). That's using a Publish Service for Instagram.